Today, on December 3rd 2012, Ricky Ponting played his final international innings. As his innings ended, so did the career of a true legend and arguably the best batsman this generation has seen. If not the best ever, I personally think he was the best batsman to play the game during the past 15 years. 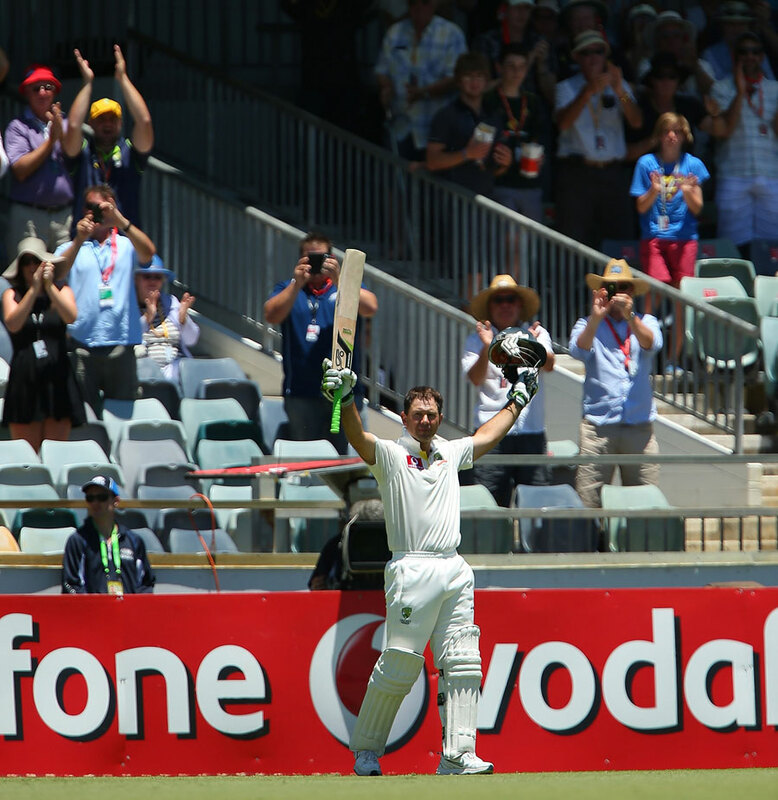 Ponting retires as the second highest run scorer ever in the history of both test matches and ODIs. He retires as a 3 time World Cup winner; twice as captain. He retires with 30 ODI centuries and 41 test centuries, the second and third highest number of tons ever respectively. He retires with an ODI average of 42, the third highest ever for all batsmen to have played over 300 innings. He retires having captained Australia in 77 test matches, winning 48 of them - a win % of 62, the second highest win % for players that have captained in at least 25 tests. He retires with the most number of ODI caps as a captain having led Australia in 230 ODIs, winning 165 of them - a win % of 76, the second highest win % ever for anyone with more than 30 ODI caps as captain. The only reason why his batting records are second or third on a list is because of the presence of two other legends with whom Ponting's career coincided - Sachin Tendulkar & Jacques Kallis. His captaincy records are second only to the man he succeeded - Steve Waugh (tests), and the man who led the best cricketing team ever (ODIs) - Clive Lloyd. The overall statistics will show that he was the second best batsman of all time in tests and ODIs, but as I mentioned above, I think he was the best. Largely because the game has not seen a bigger match winner than Ricky Ponting. In test matches, 30 out of his 41 centuries resulted in a win, as compared to 20 (51) for Tendulkar and 21 (44) for Kallis. In ODIs, 25 out of his 30 centuries resulted in a win, as compared to 33 (49) for Tendulkar. He was involved in 108 test match victories and 262 ODI victories as a player. No other cricketer has been involved in 100 test victories, with the closest being Shane Warne with 92. Kallis and Tendulkar have been involved in 76 and 66 respectively and are the only two cricketers with more than 60 test victories who are not retired yet. In ODIs, his closest rivals that are still playing are Tendulkar (234 ODI victories), Kallis (206), and Shahid Afridi (195). These are records that will probably never be broken and Ricky Ponting will remain as the biggest match winner that cricket has ever seen. Earlier this year, when Ponting's ODI career ended, I wrote about my top 5 Ponting ODI innings and hoped that I wouldn't have to write about my top 5 Ponting Test innings any time soon. But here I am, nine and half months later, doing just that. Ponting had not scored a test century for two years when the series against India began on Boxing day last year. In the second test of that series, Ponting broke that drought with a 134 in Sydney. Many wondered whether the form was back or if it was just a glimpse of Ponting of the past. In the 4th and final test of the series in Adelaide, Ponting cracked the 6th double century of his career, scoring 221. It was one of the finest test innings ever because of the circumstances and the way it was played. No one knew how much longer Ponting would play, and everyone knew he was no longer the batsman that bowlers all around the world feared. He was a much more sedate Ponting who played a classical test innings of 221. His runs came at a strike rate of 54.7 and included only 21 boundaries. That was not the Ponting we all knew, but it was a determined Ponting who was fighting to play on for far longer than the 11 months since then. South Africa declared their second innings on 194-6 to set Australia a target of 287 in 76 overs. It was a sporting declaration and one done in order to try and square a series. That was the only way for Graeme Smith and company. Most of us thought that the match will end in a draw unless South Africa were able to pick up a few quick wickets. No one really expected Australia to chase down the target even though they were known to score at 3.5-4.0 runs an over in test cricket during those days. But it was a day 5 pitch. Ponting had other ideas. He walked into bat at 30-1 in the 12th over of the innings and unleashed a belligerent attack on South Africa. He smashed 16 boundaries on his way to an unbeaten 143 of only 159 deliveries and Australia raced to the target in only 60 overs scoring at 4.76 on a day 5 test match wicket. Only Ponting was capable of something like that. The 2005 Ashes is definitely a sour memory for Ponting the captain. But Ponting the batsman will be remembered for playing one of the best test innings ever to save a test match during that series. The series was level at 1-1 going into the 3rd test at Old Trafford and England were brimming with confidence hoping to take a lead. England were on top throughout this test and had set Australia an improbable target of 423 with the Michael Vaughan giving his bowlers a full day and 10 overs to dismiss the Australians. It was yet another game that many thought would go England's way. Victory for Australia was highly unlikely and no one really expected the Aussies to fight it out for 100+ overs considering their attacking nature of play. But where there is Ponting, there is a way. Ponting threw down the anchor in that innings like never before. He curbed his natural instinct and put together his best rearguard effort ever. He batted for 9 minutes short of 7 hours, faced 275 deliveries, and scored 156. He came to the crease at 25-1 in the 11th over of the innings and the 8th delivery of the final day of the test. He did not leave the crease till the 104th over of the innings, just 4 overs before the close of play. He was the 9th batsman out for Australia and the last pair ensured that Ponting's effort did not go to waste and hung on for a draw. If even one more recognized batsman had stayed on with Ponting, he might have even gone for the target as Australia ended 52 runs short. But no other batsmen for Australia crossed 40 in that innings, which shows the true master class of Ponting's 156. Ponting was having a torrid time against Pakistan with his 3 innings in the first 2 tests of the series reading 0,0,0. Wasim, Waqar, and Shoaib had got him once each and he was horribly out of form. In the third test, Pakistan's pacers were on top and had Australia reeling on 54-4 when Ponting walked out to bat. From there on, Wasim, Shoaib, Mahmood, and Saqlian had no answer as Ponting produced a magnificent innings of 197. He was involved in a 300+ run partnership with Justin Langer that not only rebuilt Australia's innings, but also took the game away from Pakistan. For a man who was woefully out of form, he should have been a sitting duck for the in form Pakistani pacers; yet Ponting rose to the occasion and batted like he had never to notch up his then highest test score. In 14 previous test innings in India, Ponting had managed only one fifty - a highest score of 60 in Kolkata in 1998. He had never crossed 18 in the other 13 innings. He had always struggled on the spinning tracks of India, with the most famous rut coming during the 2001 series where he managed 17 runs in 5 innings including 3 ducks. So when he captained Australia to India in 2008, no one gave him a chance. Throughout his career, Ponting has been at his most dangerous when people have not given him a chance. He has always stood up and proved them all wrong, and the first test of the 2008 series against India in Bangalore was another such occasion. Ponting walked out to bat on the 4th delivery of the first morning of the series and grinded it out for five and half hours for a well made 123. His nemesis, Harbhajan Singh, and Anil Kumble could not do much to unsettle Ponting who was determined to prove his detractors wrong. With his first century in India, he ensured that he had scored a test century in every country where he had played at least two tests (Ponting has played only 1 test each in Pakistan and Zimbabwe; the only two countries where he doesn't have a test century). For all that Ponting has achieved he deserves trophies from the board, the players, and the fans. Ricky Ponting is a legend of the game and in my view the best batsman to have played the game. There was none like him, and highly unlikely that there ever will be. There was a time when it seemed like he will overtake Tendulkar as the leading run scorer in tests, but a Tendulkar purple patch coincided with a Ponting run rut and that record remained elusive. Nevertheless, Ponting leaves the game as its biggest ever match winner, and that tag will remain with him forever.